No April fools here! 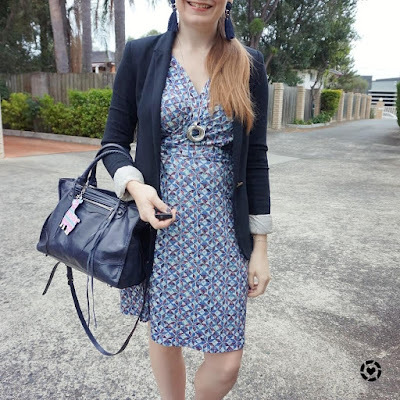 Just my go-to work outfit formula when I'm feeling uninspired (a printed dress) and another Weekday Wear Linkup at the end of the post! Because I wasn't feeling very inspired when thinking up what to wear, I went with this simple faux wrap dress, navy earrings to match the navy bag and black ballet flats to match the blazer. Nice and simple. A slightly chiller morning with some rain, so I wore my blazer for my commute to work. I usually have a blazer or cardigan with me to battle the cold aircon at work! This faux wrap dress is sleeveless so the blazer was appreciated, especially as it started raining while I took pics. I usually stay away from faux wraps being petite, but this is from the Target Danni Minogue petites's range so hits at the perfect spot! The necklace was a last minute addition and something I think didn't work that well with the dress - a different length of necklace would have been better. Last worn: navy tassel earrings, black blazer, silver circle necklace, geometric print faux wrap dress, black ballet flats, Rebecca Minkoff Regan bag. Other ways to wear: black blazer and jeans, geometric print faux wrap dress and trench coat, black ballet flats and pencil skirt, Rebecca Minkoff Regan bag and navy blouse. Perfect for pregnancy: black blazer in third trimester, geometric print faux wrap dress in second trimester, black ballet flats in third trimester. I had a cardigan in my bag to wear over this short sleeved dress in the office too, but as it was a warmer autumn morning I didn't need it to keep me warm while taking photos. 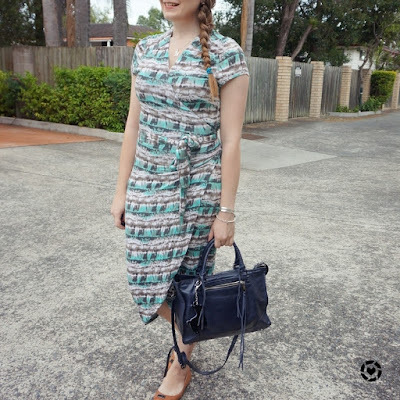 It's not the first time I've worn this wrap dress with the Regan bag and the camel ballet flats - as I pointed out on Instagram, if a combination works, why change it? I like trying something different when I rewear things, even if it's just changing an accessory, but I'll happily completely copy things I've worn before. Even if I did slightly change the outfit this time by picking a different necklace! 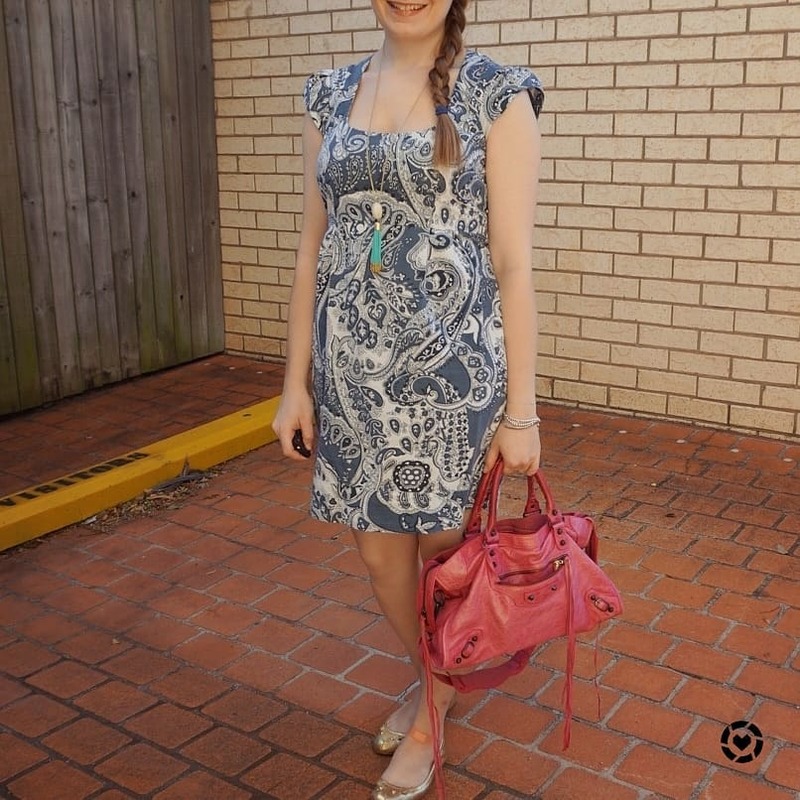 Last worn: silver initial necklace, watercolour print wrap dress, camel flats, Rebecca Minkoff Regan bag (above). Other ways to wear: watercolour print wrap dress for a birthday party, camel flats and skinny jeans, Rebecca Minkoff Regan bag and printed shorts. Perfect for pregnancy: watercolour print wrap dress in third trimester, camel flats in third trimester. A printed wrap dress is a classic that will never get old! It works perfectly in an office setting and is a simple way to get ready for work when you have little time in the morning. Perfect for those I-don't-know-what-to-wear days. Welcome to the Weekday Wear linkup! A linkup for you to share your weekday outfits - whether that is office wear or stay at home mum wear - if you wore it on a weekday, you can link it up! 1. Please link to a specific outfit post, not your blog homepage. 2. Link back to this post so others can find the link up. 3. Follow your host Away From The Blue on Bloglovin, Instagram, Twitter, Facebook or YouTube. 4. Add up to two posts and be sure to visit and comment on as many other posts as possible to get some weekday outfit inspiration! Optional: tweet the post you linked up with the hashtag #weekdayWearLinkUp so I can retweet! Linking up with Modest Monday, Turning Heads, Trend Spin, Confident Twosday, Style On The Daily, Oh Hey Girl. Summer time means I get my camis out, and wonder why I never wear them! These spaghetti strap ruffle camis are so fun to wear, even though in most offices you'll have to cover them up, with a cardigan like I did in the first outfit, or a blazer in the second. I've got another edition of my weekly linkup you can join at the end too! As mentioned above, I did throw a cardi on over this in the office, but it was much too hot that morning to take pics with it on! When I was thinking up what to wear to work I was surprised to see that I hadn't worn these pieces together before! They are both older pieces in my wardrobe, and I've worn this blue lace skirt with white tops in the past, just not this cami. I really liked the combination. Simple for a hot day and the subtle pleated texture to the cami worked really well with the textured pencil skirt I thought. Of course with the navy skirt I had to pick a navy bag, so I went with this Rebecca Minkoff Regan bag for a little matchy-matchy. 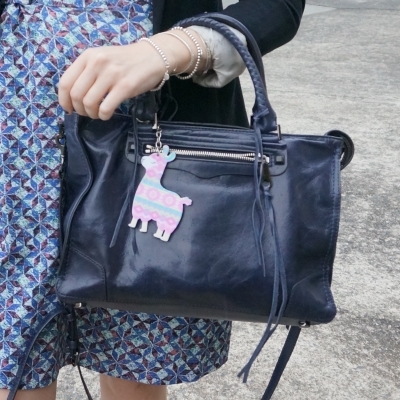 This bag is a great neutral base, perfect for further accessorising so I added my new llama keychain. 😂 I have a lot of fun bag charms, but this one made me smile as soon as I saw it and I knew I had to buy it right away! I added more colour to my outfit with this dotty necklace, such a great accessory with the blue and white. Last worn: white cami, colourful statement necklace, blue lace pencil skirt, silver ballet flats, Rebecca Minkoff Regan. Other ways to wear: white cami and maxi skirt, blue lace pencil skirt in monochrome outfit, silver ballet flats and skinny jeans, Rebecca Minkoff Regan and pleated skirt. Perfect for pregnancy: white cami in second trimester, blue lace pencil skirt in third trimester, silver ballet flats in third trimester. A little cooler this morning (although not by much!) so I had my blazer on in photos. This cami looks a bit rumpled in the photos, but it was a pleasure to wear. Again, it was a simple outfit, I like peach and navy together so the jacquard skirt and plain ruffle cami seemed like a good pairing. I was in a bit of a rush that morning though and not feeling the best, so a hastily half tucked cami is what you get! I actually wasn't sure I'd make it through the whole day at work, but with a lot of meetings I powered through and got to the end of the day. Overall I liked this outfit as much as the one above, I just didn't enjoy wearing it as much as I wasn't feeling the best! Last worn: jersey blazer, peach ruffle cami, tassel pendant necklace, jacquard pencil skirt, Walnut Melbourne ballet flats, Rebecca Minkoff Regan bag (above). Other ways to wear: jersey blazer and jeans, peach ruffle cami and pleated skirt, jacquard pencil skirt with mustard, Walnut Melbourne ballet flats and lace dress, Rebecca Minkoff Regan bag and wrap dress. Perfect for pregnancy: jersey blazer in third trimester, jacquard pencil skirt in first trimester, Walnut Melbourne ballet flats in second trimester. 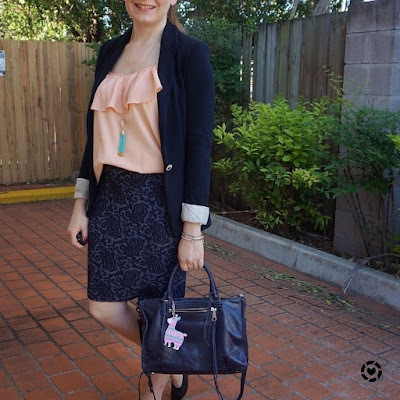 A classic cami and pencil skirt is a work staple! In most offices, spaghetti straps are frowned on or just not allowed in the office dress code. 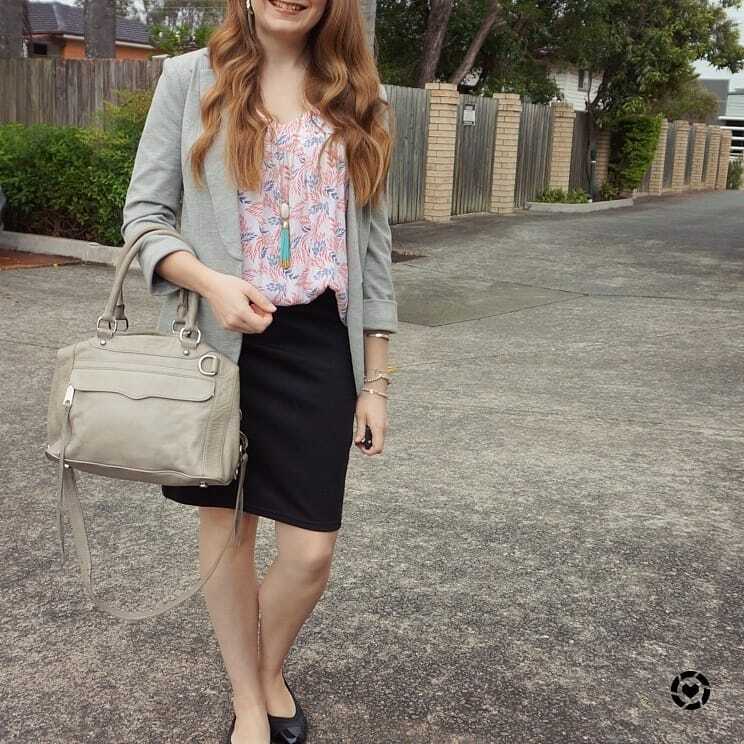 It's easy to cover up and make your look a little more formal with a blazer, perfect for a day of meetings! Or if your office is a little more casual like mine you could just throw a cardigan on top. Linking up with Modest Monday, On Mondays We Link Up, Style Sessions, Turning Heads, Style On The Daily, Oh Hey Girl, Thursday Moda, Labour of Fashion, Fashion Files, Chic and Stylish, Weekend Wear, Flashback Fashion. Two simple summer office outfits, with two pretty printed dresses and a pink Balenciaga city bag. All pieces I love and have worn before, but I do have something new to share with you - a new outfit linkup! Sometimes I find the square neckline of this sheath dress a little tricky to accessorise, I often debate for a while each morning about what necklace to wear. This long pendant necklace has been a frequently worn one lately though, so I decided to give it a go and I really liked the combination! 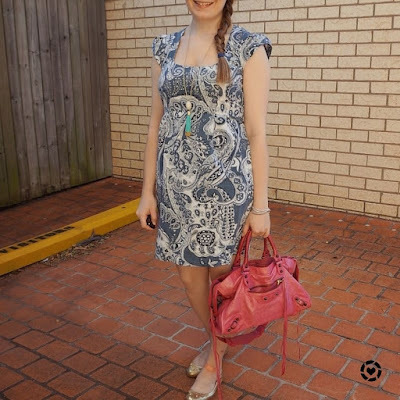 The paisley print dress and pink Balenciaga city bag are frequently worn together, I really like pink and blue! And as I had a gold necklace, these gold mouse flats were an obvious shoe choice. Really easy summer office style. I did have a blazer too for the cold aircon in the office, but it was much too hot to wear it for photos in the morning. Last worn: long tassel necklace, paisley print sheath dress, gold mouse flats, Balenciaga sorbet city bag. Other ways to wear: paisley print sheath dress and blazer, gold mouse flats and pencil skirt, Balenciaga sorbet city bag in winter. Perfect for pregnancy: paisley print sheath dress in second trimester, gold mouse flats in second trimester, Balenciaga sorbet city bag in second trimester. It was a little cooler this morning (although not by much) so I wore my blazer for the pics. Again I picked a gold necklace to wear with the blue printed dress, this Kmart one is another frequently worn one, and so cheap too! For the blazer, shoes and belt I went with black, due to the darker colours in the Ikat print of the dress. While the blue print in this dress is darker than the one above, I still think the pink Balenciaga city bag is a fun accessory with it - it really pops with the darker background. A little bit of a quieter day at work meant the opportunity to get some training in too which was wonderful - we have an online training site but I so rarely get the opportunity to use it and there were some courses I've been wanting to do for a while! Last worn: black jersey blazer, blue and gold necklace, Ikat print dress, velvet belt, black ballet flats, Balenciaga sorbet city bag (above). Other ways to wear: jersey blazer and jeans, Ikat print dress with green, velvet belt over a blazer, black ballet flats and skinny jeans, Balenciaga sorbet city bag and shorts. Perfect for pregnancy: black jersey blazer in third trimester, Ikat print dress in third trimester, black ballet flats in second trimester, Balenciaga sorbet city bag in second trimester. 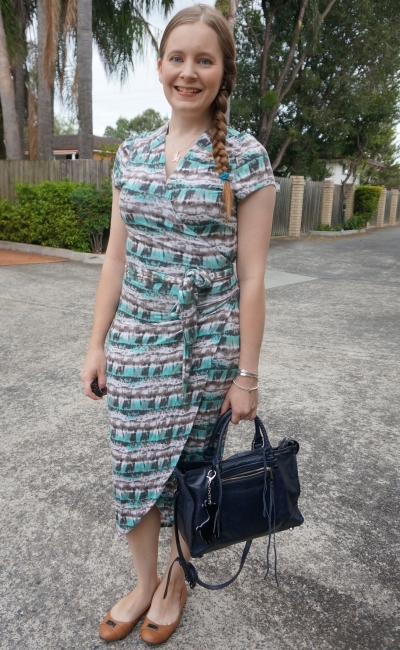 A printed dress is such an easy office option as you can just pull-on and go. 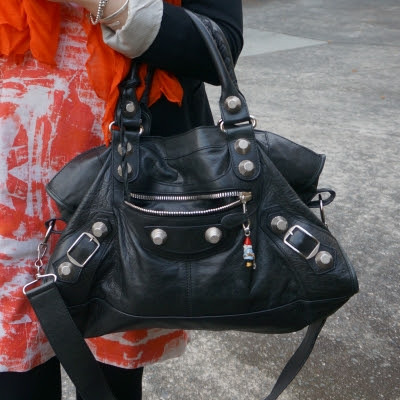 You can always accessorise with a nice neutral like all the black pieces I wore in the second outfit, or make a brightly coloured dress even brighter with a bold bag like the pink Balenciaga city. Linking up with Turning Heads, Confident Twosday, Trend Spin, Oh Hey Girl, Fashion Files, Thursday Moda, Fabulous Friday, Weekend Wear, Fabulous Friday, Weekend Wear, Friday Faves. I think the one item of clothing I have most of in my wardrobe is printed tanks! They work so well for my casual stay at home mum days, but also in the office too with a blazer on top. The two I'm wearing below are some of my favourites, gifts from my mum. Keeping things simple and letting the printed tanks be the stars of my outfits, I picked neutrals for everything else, including this grey Rebecca Minkoff MAM bag. As much as I loved this outfit, it was my hair that got a lot of love on Instagram 😅 It's day 3 of the curls from when I curled my hair for our annual Christmas family photo. This is the hair curler I use. I felt with the relaxed hair and long tassel necklace, the grey blazer was the perfect way to dress this outfit up a bit more for a busy day with a few big meetings. 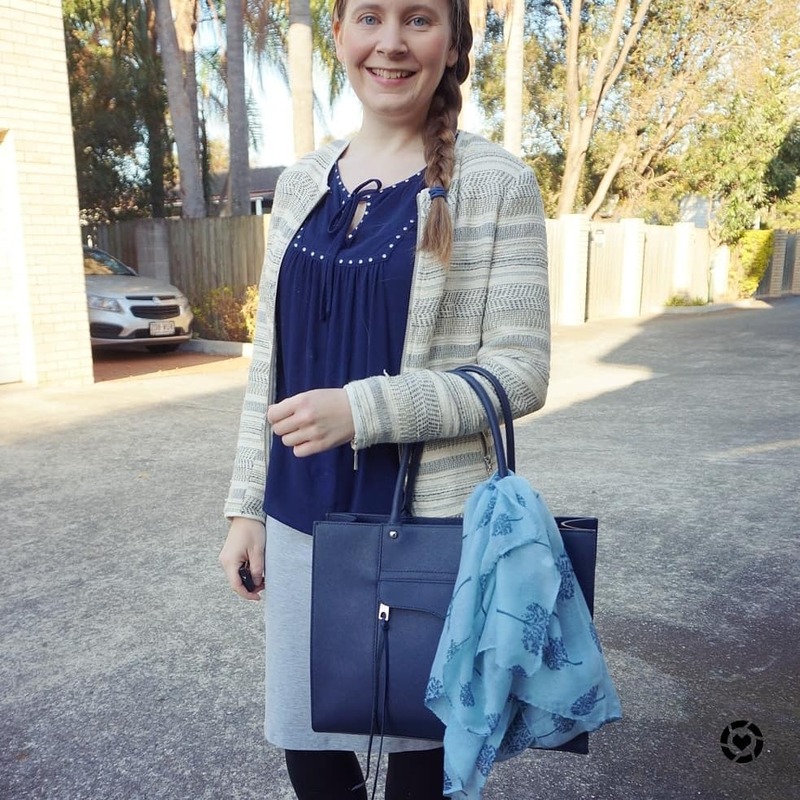 I had a bit of a giggle when I went to write this post and realised everything is from Jeanswest, except the shoes and bag! The jersey blazer and pencil skirt were comfortable and perfect for the cooler office, despite the warmer day outside. 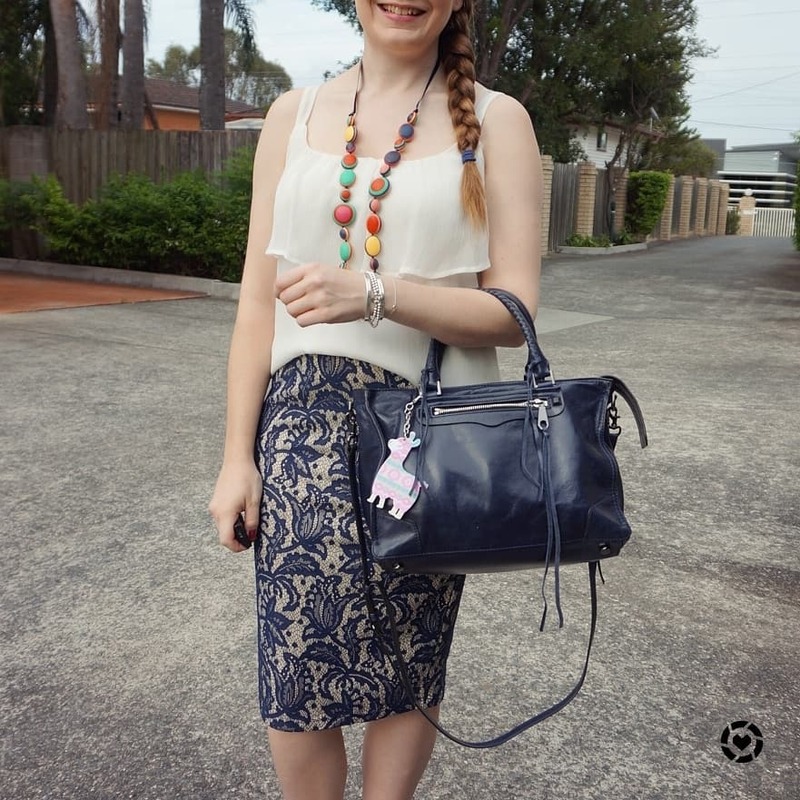 With the pastel pink, red and blue in the print of the tank and the turquoise tassel on the necklace, I thought this grey Rebecca Minkoff MAB bag was the perfect neutral accessory to wear with it. 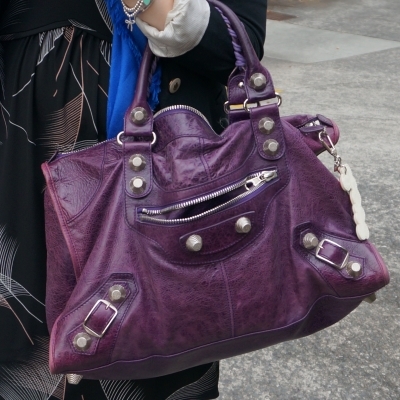 And it felt like a while since I last wore the bag, it was definitely overdue a wear! Last worn: grey jersey blazer, dangly earrings, tassel necklace, fern print tank, black pencil skirt, Walnut Melbourne ballet flats, Rebecca Minkoff Mini MAB. Other ways to wear: grey jersey blazer and striped dress, fern print tank worn two ways, black pencil skirt over a dress, Walnut Melbourne ballet flats and skinny jeans, Rebecca Minkoff Mini MAB and denim shorts. Perfect for pregnancy: black pencil skirt in first trimester, Walnut Melbourne ballet flats in third trimester, Rebecca Minkoff Mini MAB in second trimester. This tank always makes me smile when I wear it. Red is a cheerful colour to wear, and I also like this as I've had it for a few years and wore it through my pregnancies with my boys. It's nice being able to enjoy a piece in your wardrobe you've had for years. I've worn this top casually with jeans and a few times to the office with pencil skirts. 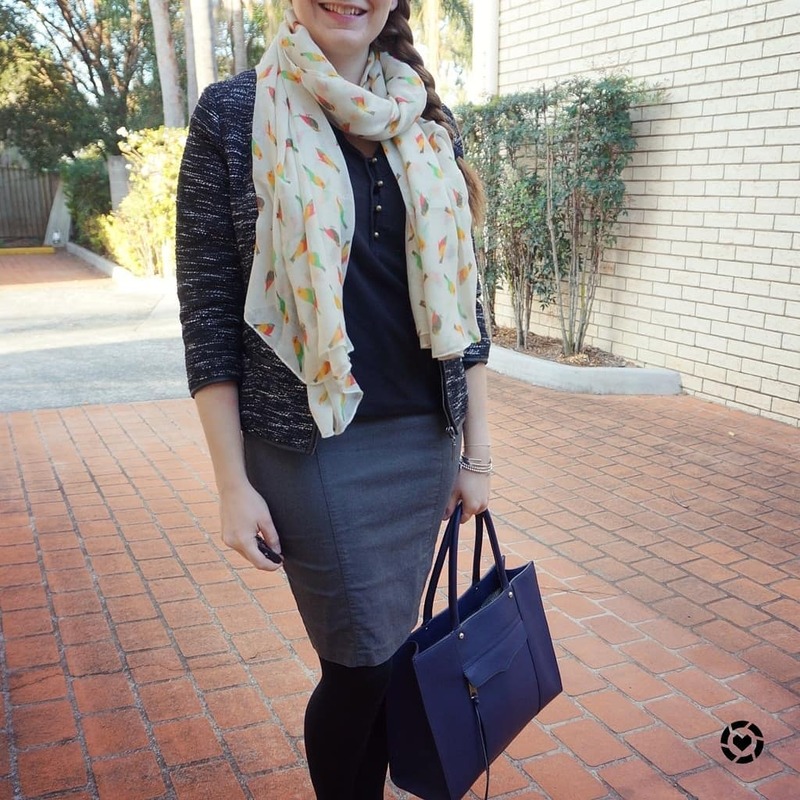 Like the printed tank above, I think it looks lovely tucked into a classic black pencil skirt. I picked a simpler silver heart pendant necklace to wear with this, and silver ballet flats to match the necklace and hardware on the MAM bag. I did have a cover up for in the office too, but it was much too hot and humid in the morning to want to take a pic with it on. I shared a pic with my cosy cardi on Twitter. Of course I couldn't stop at just the shoes, bag and necklace matching, I had to add a red hair tie to my hair to tie in with the print on the tank! I bought a huge bunch of colourful hair ties in a Priceline sale a while back and every now and then I'll be able to match the hair tie to my outfit! 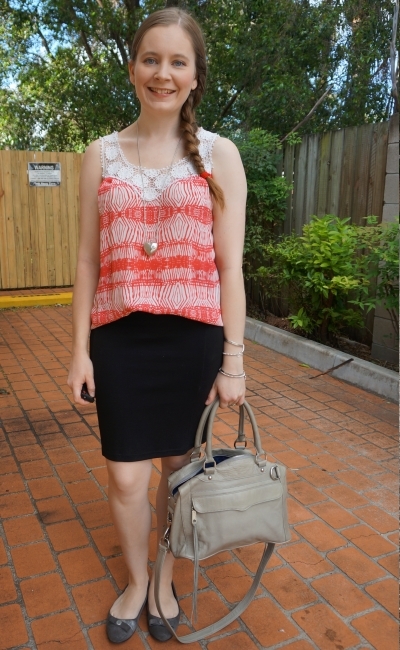 Last worn: red crochet print tank, silver heart necklace, black pencil skirt, silver ballet flats, Rebecca Minkoff MAM bag (above). 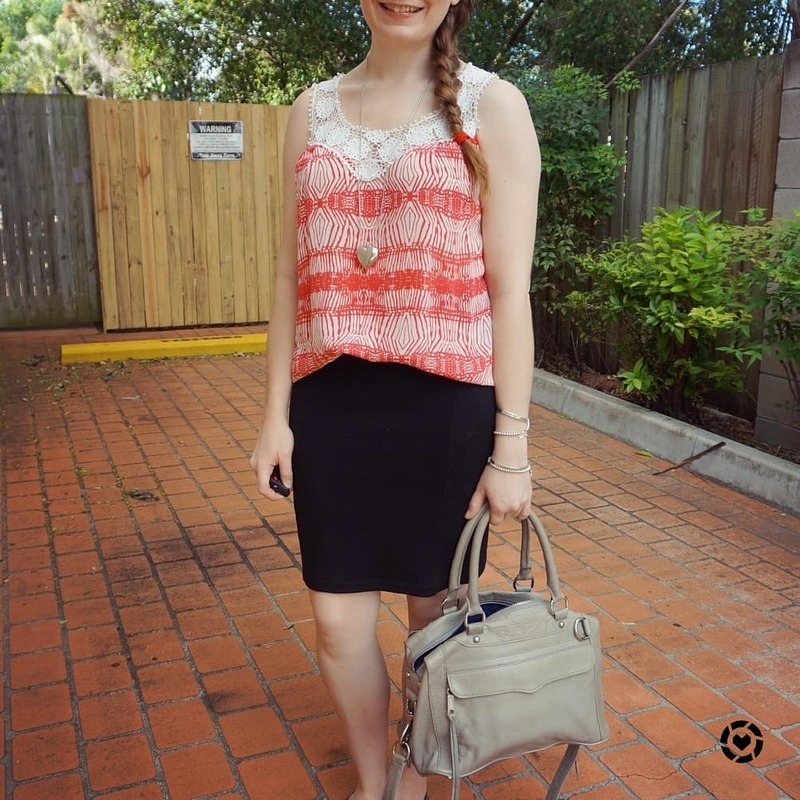 Other ways to wear: red crochet print tank and shorts, black pencil skirt and printed shirt, silver ballet flats and jeans, Rebecca Minkoff MAM bag and maxi skirt. Perfect for pregnancy: red crochet print tank in third trimester, black pencil skirt in second trimester, silver ballet flats in third trimester, Rebecca Minkoff MAM bag in third trimester. 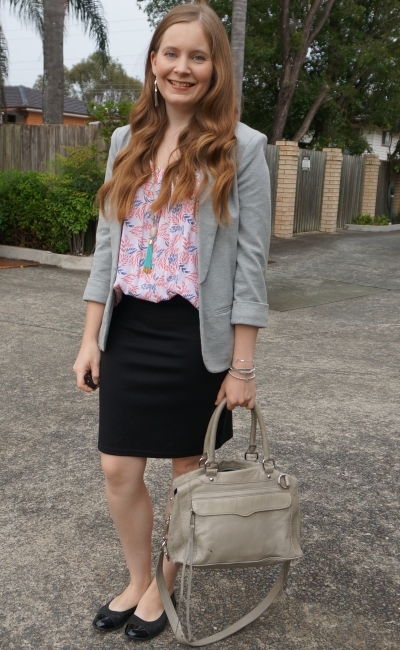 A printed tank can easily work for a business casual office. It's a fun way to add a little colour to a neutral suit or suit separates. If you need to dress a little more formally, you can cover up the casual tank with a blazer to make it look more office appropriate. The blazer has the added bonus of keeping you warm in the cold air con too! 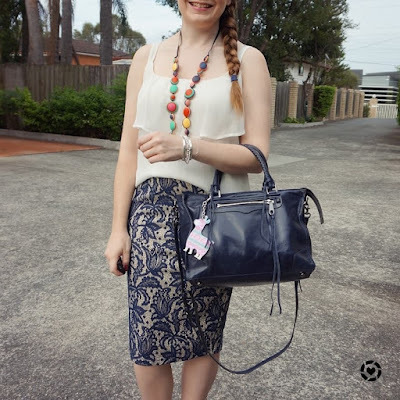 Linking up with Turning Heads, Confident Twosday, Trend Spin, Style Sessions. When I'm feeling uninspired picking workwear I make things easy on myself and pull on a printed dress! While both of these dresses are different styles and prints, they solved my 'no idea what to wear' dilema by becoming instant, easy outfits. 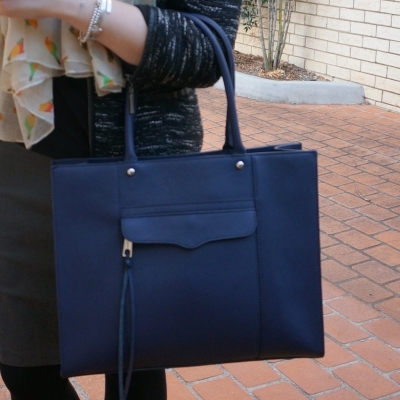 I added some bright scarves and Balenciaga bags and I was ready for the office! I really liked the colours in this outfit, with pink blue and purple together. Not the first time I've worn that combination to the office. The pink statement earrings were won in a giveaway and I thought they worked perfectly with the pink fern print on the dress. Despite the earrings being gold and the hardware on the bag being silver, I think because they are far enough apart from each other the combination still works. 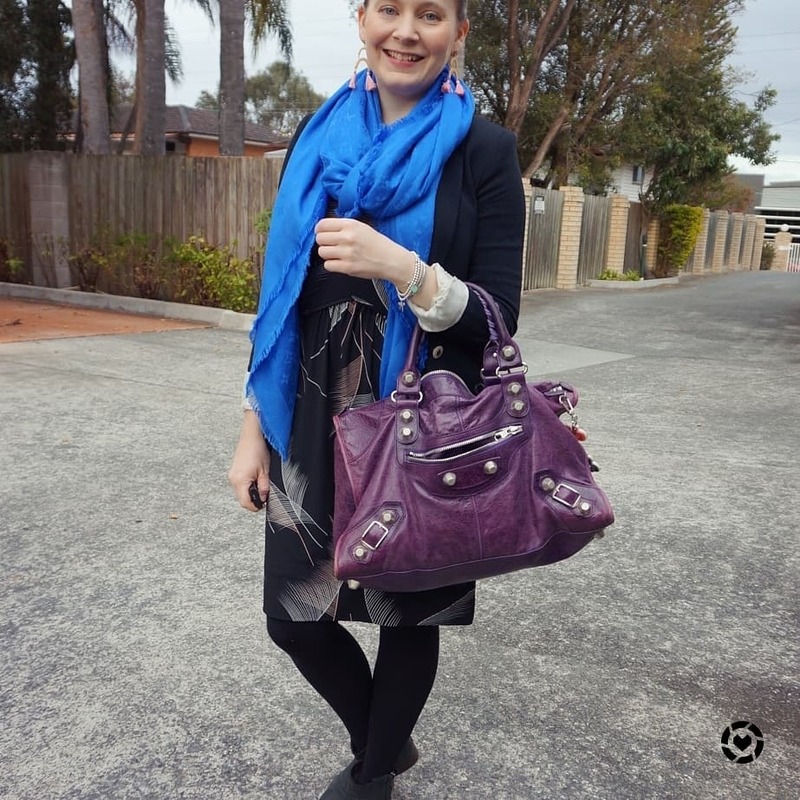 Originally when I'd put this together I had planned to wear my purple scarf, to match my purple bag. A text from my colleague the evening before reminding me we needed to wear blue that day made me pick this Louis Vuitton shawl instead. I adore this scarf so much, it's so cosy! As it's always cold in the office, I kept it on all day and matched the rest of the team wearing blue perfectly. The ankle boots were a necessity with the cooler morning. Despite thinking the week before it was time to retire my tights, I was happy to have them this morning with the overcast and cooler day with lots of rain forecast. Last worn: jersey blazer, Louis Vuitton shawl, Leona Edmiston dress, black ankle boots, Balenciaga Work Bag. Other ways to wear: jersey blazer and fit and flare dress, Louis Vuitton shawl with stripes, Leona Edmiston dress and grey accessories, black ankle boots worn 30 ways, Balenciaga Work Bag and skinny jeans. Perfect for pregnancy: jersey blazer in third trimester, Leona Edmiston dress in second trimester, black ankle boots in second trimester. My most popular YouTube video with over 74,000 views! 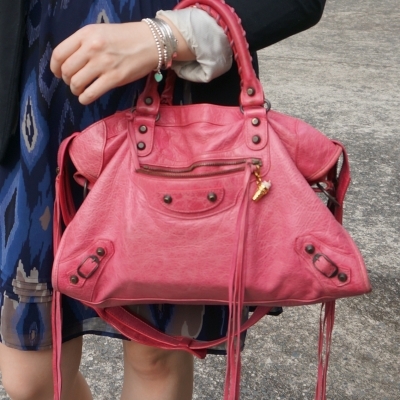 Short and sweet talking you through some popular Balenciaga styles. A completely different look even though this follows the same outfit formula as the one above. I even wore the same blazer. 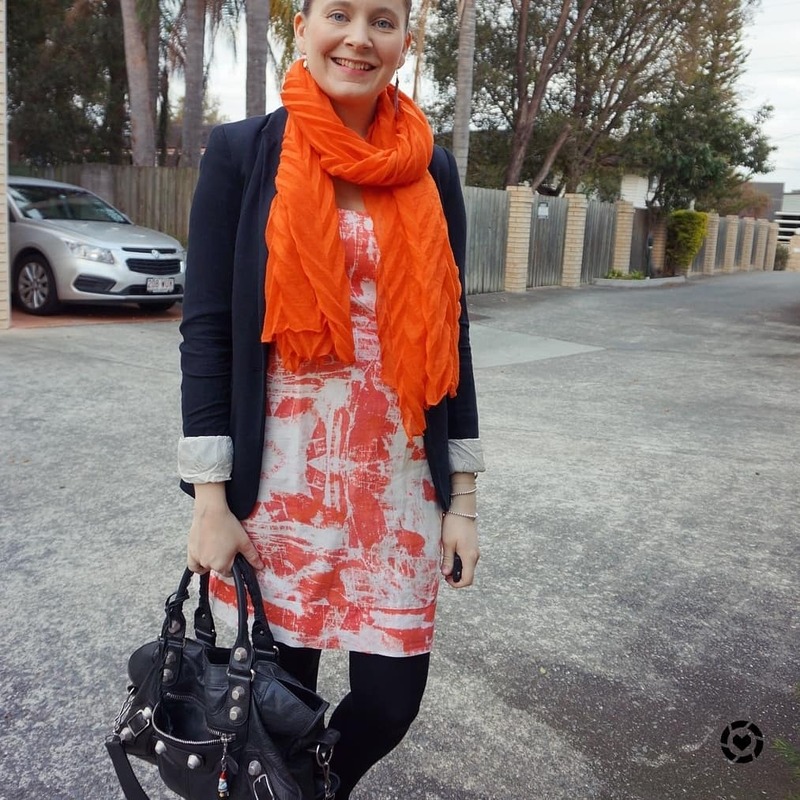 I can't believe it's taken me this long to wear the orange crinkle scarf with this printed orange sheath dress, it's the perfect matchy-matchy layer! With all of the colour in my scarf and outfit, I decided to go with neutral accessories this time, letting the scarf and dress be the touch of colour against all of the black. I really liked this outfit. You might recall me saying a few times I'm wary of wearing black with the orange dress as it reminds me of Halloween but I think it worked really well. When I was popping out to get lunch one of the sales people standing on the street complimented my outfit as I ran past shaking my head. Was nice of them to do that, but I was too busy to stop to see what they were selling! 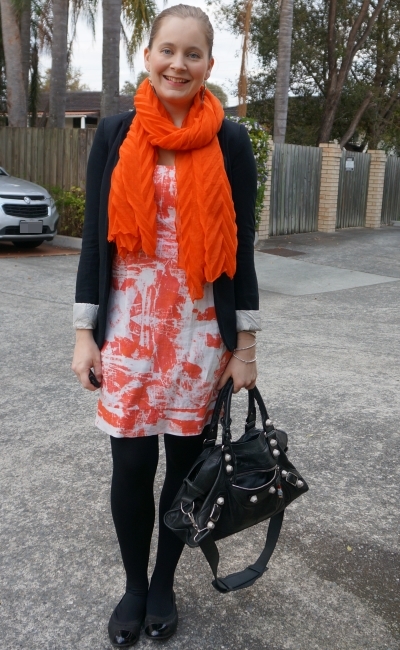 Last worn: jersey blazer (above), orange crinkle scarf, orange sheath dress, black ballet flats, Balenciaga Part Time Bag. Other ways to wear: jersey blazer and a-line skirt, orange crinkle scarf and navy dress, orange sheath dress under a knit, black ballet flats and jeans, Balenciaga Part Time bag worn 30 ways. Perfect for pregnancy: jersey blazer at 39 weeks, orange sheath dress in first trimester, black ballet flats in second trimester, Balenciaga Part Time Bag in second trimester. Printed dresses are an easy and quick outfit to put together for the office. You can accessorise them with bright and colourful scarves. You could try using the scarf to introduce another bold colour to your outfit like the first pics, or by matching the scarf to a colour in the print of your dress like the last outfit. Linking up with Confident Twosday, Turning Heads, Trend Spin, Style Sessions, Style On The Daily. When the weather warmed up a little it was good to leave my trench coats behind and wear some lighter jackets better suited to spring. As both of these jackets are textured I kept the rest of my outfit simple, with neutral shoes, a big navy tote and plain tops with grey pencil skirts. 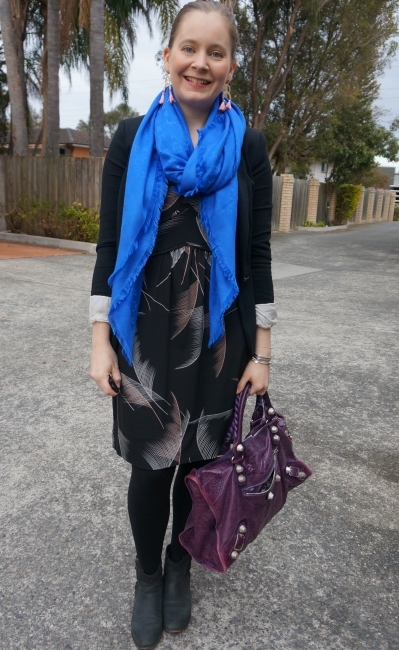 I knew that this light blue family tree print scarf would work really nicely with the navy blue blouse. I wasn't too happy with how it looked with the busy jacquard jacket though. I knew I'd appreciate the scarf in the cold office air con, so decided at the last minute to accessorise my bag a bit by knotting the scarf on it. 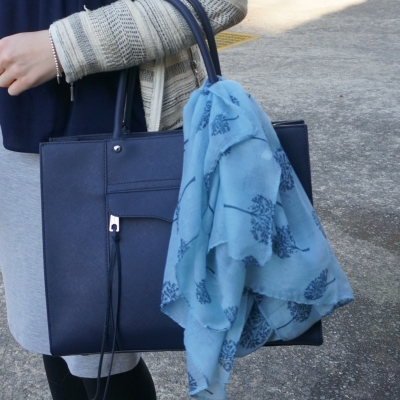 I think the blue scarf worked just as nicely with the navy tote as it did with the navy blouse when I wore it to keep warm in the office. 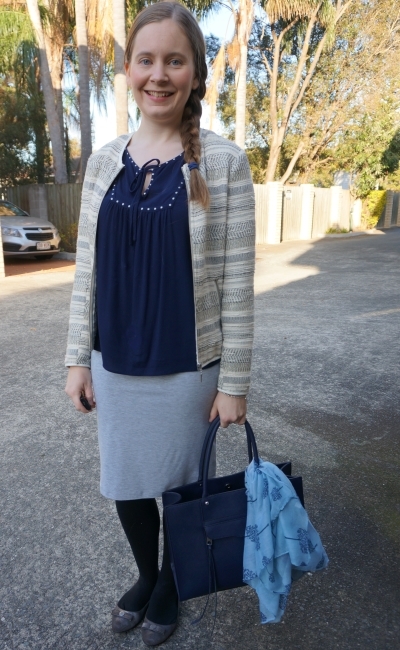 With the metallic thread running through the jacket, the silver ballet flats were an obvious choice, I do like a bit of matchy matchy, with even the top and bag matching too. This pencil skirt is a comfortable grey jersey I sometimes worry is a little too casual, but for a mostly quiet day with little face to face meetings it was perfect. And it doesn't look out of place when others in the office are wearing jeans! 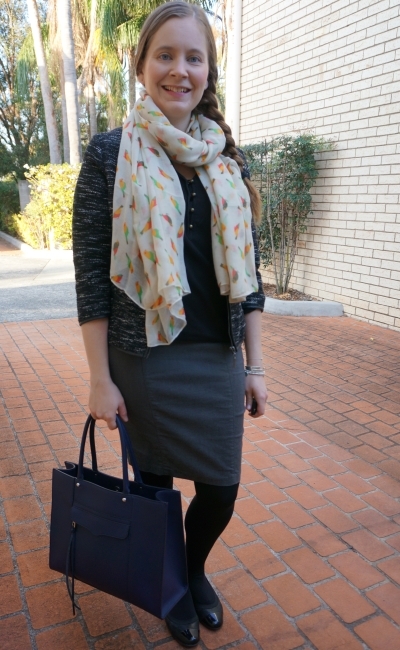 Last worn: jacquard blazer, family tree scarf, navy studded blouse, grey jersey pencil skirt, silver ballet flats, Rebecca Minkoff medium MAB tote. Other ways to wear: jacquard blazer and jeans, family tree scarf and stripes, navy studded blouse worn two ways, grey jersey pencil skirt and Converse, silver ballet flats and purple pants, Rebecca Minkoff medium MAB tote and sheath dress. Perfect for pregnancy: jacquard blazer in third trimester, grey jersey pencil skirt in third trimester, silver ballet flats in third trimester, Rebecca Minkoff medium MAB tote in first trimester. Since I loved the plain top, textured jacket and grey pencil skirt combo, I tried it again the next time I was in the office. This time around, with the black boucle jacket and plain black top, I felt the outfit needed a bit of colour. I decided to wear this colourful parrot print scarf. Despite the busy texture of the jacket, I think the printed scarf worked well as the top of my outfit was all black, unlike the first outfit. I really enjoyed wearing this - and the more formal fabric of the pencil skirt made me feel suitably attired for a couple of big meetings I had during the day. I was glad when the day was over though, it was such a busy afternoon, I even had to cancel lunch with hubby to get more work done. Last worn: boucle jacket, parrot print scarf, black blouse, grey pencil skirt, black ballet flats, Rebecca Minkoff medium MAB tote (above). Other ways to wear: boucle jacket and a-line skirt, parrot print scarf and blue knit, black blouse and leopard print jeans, grey pencil skirt in winter, black ballet flats and jeans, Rebecca Minkoff medium MAB tote and fit and flare dress. Perfect for pregnancy: boucle jacket in second trimester, black blouse in second trimester, grey pencil skirt in first trimester, black ballet flats in third trimester, Rebecca Minkoff medium MAB tote in third trimester. Textured jackets are a nice alternative to a plain jacket and add some extra interest to your outfit. To keep things simple, you can wear them with plain, block colour pieces and let the jacket shine and be the statement part of your outfit. They work nicely in the office, fitting in with any dress code. 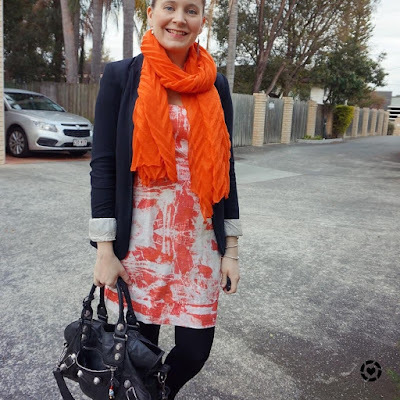 Linking up with Turning Heads, Confident Twosday, Style Sessions, Fashion Frenzy.